I have the latest release. I have run defraggler on tow of my machines. In both cases my self made icons lost their image and pointers. Plus a bigger problem is that a folder I created for downloads lost all data! This is the first time I have ever seen this happen. Any help please. I just verified that on both machines the folder Download has nothing in that folder. I am reloading from by backup. Never had this problem before. What is the issue? Defrag shouldn't affect any of that. It just moves things about. I'm wondering if the download folder is a clue here? The fairly new Storage Sense feature in Win10 now cleans the contents of the download folder unless you tell it not to. It shouldn't run by default, but it's something to look at if you have Win10. I thought the same thing. However I have 2 towers/desktops and 1 laptop. The download folder on all 3 PCs has no data. The only thing I ran was the defrag. The only folder impacted that I can tell was Download. One tower has Optane memory, the other 2 do not. Yes it is Windows 10, version 1803. I am totally at a loss. I will research Storage Sense to see what it is and how it is run (auto or manual). I appreciate your reply. Currently I am lost and confused. Storage Sense will run a clean occasionally in the background if you have it turned on. I'm not sure though if the download folder is cleaned in 1803, I know that it is with 1809. 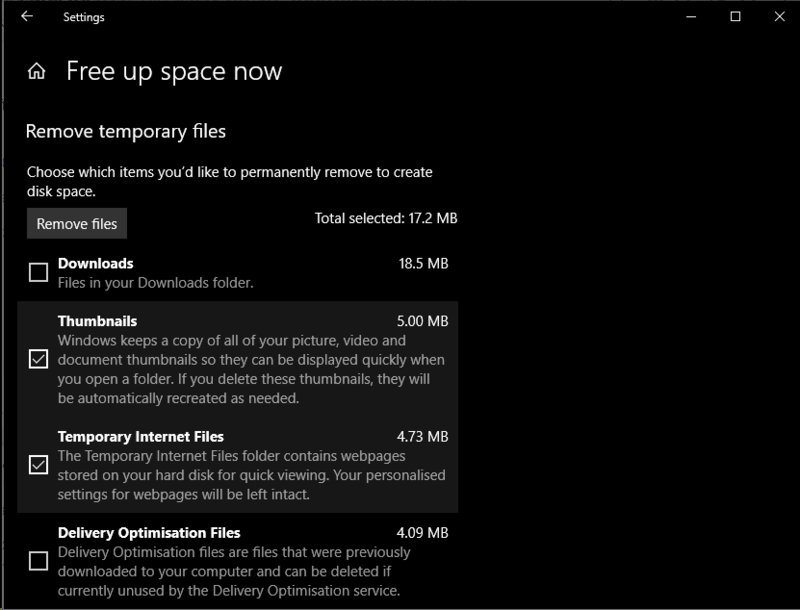 You could try a 'Free up space now' and see if it includes the download folder. I now make sure to move anything I want to keep out of the Downloads folder, just in case Windows decides to clean it. PS. The fact that 3 different machines seem to be affected is interesting. I would possibly suspect a Windows update in that case, although I've not heard of the latest updates deleting files there was one last year that did if you had some folder redirects set. (If I remember it was the update to 1809). Yes, ver 1803 has the same storage sense and the same folders and selections. I have unchecked all the boxes and turned this wonderful service OFF! I have no problem with Storage Sense itself, it's merely a newer version of Disk Clean-up that allows a scheduled automatic clean or a manual clean. The problem came when Microsoft added the Downloads folder to the cleaning and didn't realy tell anybody that they had. (They also added it to Disk Clean-up at the same time). Once you know about it then you can avoid it in Storage Sense. In 'Change how we free up space automatically' there is an option to never clear the Downloads folder, or only clear files that have been there for over so many days.